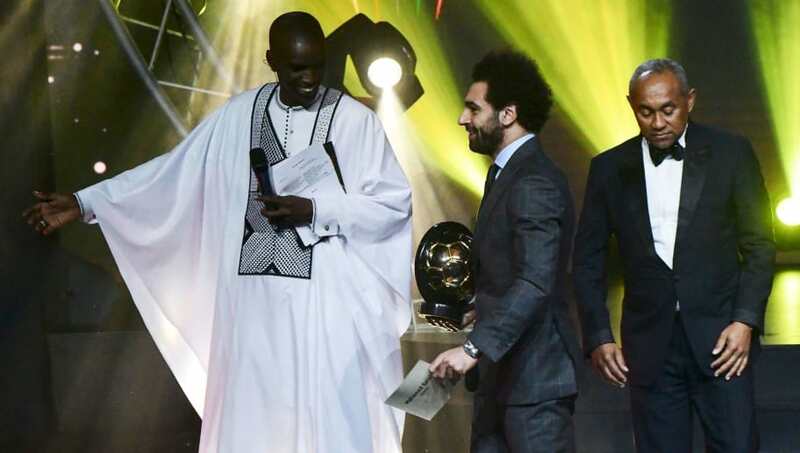 ​Mo Salah made history on Tuesday night by becoming just fourth player ever to win the CAF African Player of the Year award in successive seasons. The Liverpool forward beat out teammate Sadio Mane and Arsenal striker Pierre-Emerick Aubameyang to the prestigious title, at the ceremony held in Dakar, Senegal. With most fans and pundits expecting a Salah victory, the biggest story to come out after the night was not the win itself, but the way it was received. After the Egyptian had come on stage to collect his trophy from CAF president Ahmad Ahmad and Liberia president, and 1995 Ballon d'Or winner, George Weah, a live band were brought on stage to ignite the festivites. At first a surprised Salah stood there with an akward smile, unsure of how to proceed, before he slowly succumbed to the rhythm after unrelenting encouragement from the lead singer, and his teammate ​Mane. The Senegalese forward's reaction was particularly hilarious, as he repeatedly cracked up watching Salah's attempts at cutting shapes. And, he wasn't the only Red to be amused by the situation, with backup goalkeeper Simon Mignolet jokingly tweeting: "Congrats Mo! Fully deserved. I guess we know how you’ll be celebrating your next goal!" ​Liverpool fans were equally entertained by the proceedings. Here is a selection of their reactions on Twitter. If he doesn't pick the ball up and copy this celebration next time he scores I'll be devastated. Tuesday night's award put the icing on the cake of an already exciting day for the 26-year-old Egyptian, as his country were handed the hosting rights to the 2019 African Cup of Nations, after Cameroon had been stripped of the privilege due to financial and infrastructural issues.